Здравствуйте! 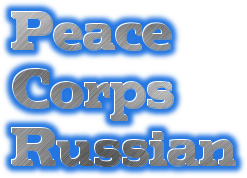 This Russian course was developed by the U.S. Peace Corps for its volunteers going to Kazakhstan. It can be useful as a primer for learning the basics of the Russian language. You can listen and follow along to each lesson or download the whole course directly. 11 Lesson 10 – Can/May I? Today Russian is still spoken by the overwhelming majority of people in the former Soviet Union. It will be useful to learn a few phrases of courtesy, for example: to express initial greetings, to ask about well-being of others, to introduce oneself etc. The Russian language belongs to the Slavic group of the Indo-European language family and is considered one of the most important world languages. Russian was the official state language of the Soviet Union. After the disintegration of the USSR, Russian remains the state language of Russia and it is still the language of about 200 million people, including 16 million in Kazakhstan. Although Kazakh is the state language of Kazakhstan, Russian is the predominant language spoken. Russian belongs to the inflectional languages (i.e. languages in which words have endings). A Russian word can have many different forms, and therefore not every word encountered in a text can be found in dictionaries. Russian words that have endings are entered in the dictionaries in a definite form. The definite form for nouns is the Nominative case singular, for adjectives it is the Nominative case singular masculine, and for verbs – the infinitive. Adverbs, prepositions and conjunctions are invariable. The Russian alphabet is comprised of 33 letters. Stress, in Russian, can fall on any syllable in a word. One word has only one stressed syllable which is longer than others. Usually, the stress is indicated in dictionaries. Verbs: there are three tenses: the present, the past, and the future. All verbs also have an aspect – imperfect and perfect. Most local people are delighted and flattered by foreigners who attempt to speak their language. Your efforts will be generously rewarded. It will be useful to learn a few phrases of courtesy, for example: to express initial greetings, to ask about well-being of others, to introduce oneself etc. Boys and girls of the same age use only the first name when they talk to each other. When they greet each other they use [ZDRASTvui]. 2. When a young person greets a group of boys and girls or an adult s/he uses the word [ZDRASTvuitih]. 3. If you are addressing a person older than you or any adults, then use that person’s first name and patronymic. Remember that a foreigner addressing a local person for the first time should use this form, unless greeting a young child. Locals do not use patronymic when addressing a foreigner, since most foreign first names would form rather strange-sounding patronymics. 6. До свидáния (literally “Until our meeting”) is used by both adults and children when saying goodbye to one or more person. These forms are used only among very good acquaintances. A young person would never use these forms in speaking to an adult. If you want to avoid mistakes in greeting people or saying goodbye, use the forms that are acceptable in polite and formal relationships: [ZDRASTvuitih] and [dasvihDAHniya]. A. How to ask people about themselves? 3. When you ask [kak tihBYA zaVOOT], local children usually give a first name. When you ask adults [kak vas zaVOOT], they will give a first name and patronymic. 4. To learn the last name requires a second question: “Как твоя фамúлия?» [kak tvahYA fahMEElihya] (for children) or «Как Вáша фамилия» [kak VAHshah fahMEElihya] (for adults). B. How to say something about yourself? I’m from America. Я из Амéрики. [YA izaMyEriki]. C. How to ask people about themselves? How to say something about yourself? B: – I’m from America. – Я из Амéрики. [ya izaMyErikih]. Lesson 10 – Can/May I? The rest of the idea can be expressed by your eyes, your hands, or your actions. I want to sleep. [ya haCHOO spaty] Я хочý спать. I’m hungry. [ya haCHOO yesty] Я хочý есть. I’m not hungry. [ya nihaCHOO yesty] Я не хочý есть. I’m thirsty. [ya haCHOO peety] Я хочý пить. I’m not thirsty. [ya nihaCHOO peety] Я не хочý пить. I’m tired (for a man). [ya oosTAL] Я устáл. I’m tired (for a woman). [ya oosTAla] Я устáла. It’s important. [Əta VAZHnah] Это вáжно. It’s urgent. [Əta SROCHnah] Это срóчно. It is very tasty. [Ochiny FKOOSnah] óчень вкýсно. I don’t eat meat. [ya niYEM MyAHsah] Я не ем мясо. I don’t eat fat. [ya niYEM ZHEERnava] Я не ем жúрного. I don’t eat eggs. [ya niYEM YAItsah] Я не ем яйца. I don’t drink (alcohol). [ya niPyYU] Я не пью. I don’t drink milk. [ya niPyYU mahlahKOH] Я не пью молокó. I’m a vegetarian. [ya vigitariAHnits] Я вегетариáнец (male). I’m a vegetarian. [ya vigitariANkah] Я вегетариáнка (female).